Sign up for my email list to hear about the next time I run The Body Passion Project! What if you loved your body wholeheartedly? I am sooo very grateful for your amazing guidance, leadership, personal and professional example, creative ideas and sharing. You are a soothing and gentle, powerful and empowering, caring and nurturing voice. I've spent decades averting my eyes when I look in the mirror. Those times I looked, really looked, I wasn't happy with what I saw. I don't curve in all the places women are supposed to curve. I have a big round belly, always have. It's my natural state. I’ve always had a pot belly. It’s just how I’m shaped. Embracing that fact and the fact that it’s not the accepted beauty norm has helped me to love myself, big belly and all. In our culture, not conforming to the commonly accepted standards of beauty is not acceptable. And induces life-long shame. But I know you know that already. Women (well, okay, girls) are indoctrinated with negative messaging: Take up LESS space. Be QUIET. Be NICE. GIVE. Put others FIRST. So much of this causes us to work actively to diminish ourselves. It’s a culture of feminine self-harming. Diet after diet after diet. Silencing ourselves. Putting ourselves down. Obsessing about our size and shape. Comparing ourselves to others to the point of severe depression, anxiety, and self-hate. How do we even begin to unlearn these decades of indoctrination? How do we end these wounding belief systems? How do we even begin to unravel all of this? And where does the transformation begin? My belly is big and round. TLDR: I think it begins with creativity. My relationship with my body has been one of tolerance. And I don't mean that in a good way. Tolerance, surrender, acquiescence. All of those feelings of waving the white flag. "Ok, I give up. This is me." But all that pulls me down. Rather than judgment, criticism, denial, shame, and sadness, I want to EMBRACE ME. I want to LOVE my body. I want to find comfort in my own flesh. I want to feel joy and passion, delight and bliss…about MY BODY. Lots of people talk about self-compassion. Frankly, I'm not really interested in self-compassion. What I really want is self-PASSION! The Body Passion Project profoundly changed the way I perceive my body by helping me confront the reasons for my feelings of brokenness and unworthiness, and examine them to see if they are, or ever were, useful. I was able to let the bulk of them go as excess, unnecessary baggage, and to embrace a new, positive set of feelings about myself. Wouldn't it be amazing to feel full-on pleasure and joy every time you looked at yourself in the mirror? What would change in your life if you felt that way? I don't know many women who fully love their bodies. I don't know many women who accept their bodies without judgment. The last time I wore a bikini I was 13 years old. Suddenly I was aware of my softness, the rolls of flesh, my belly. I never put one on again. This is part of my Body Story. And that, my friends, is just a tragedy. We are bombarded with images our whole lives of women who are worthy only when they are (fill in the blank) _____________ [thinner, sexier, have bigger breasts, less hairy, younger, blonder, curvier, better mothers, more active, and on and on]. I want to help you deal with these same conversations in your head. I want to help you get through that morass and find a way into a new relationship with your body. A relationship of Body Passion. The way we'll do it? ...and other creative endeavors...intimate women's community...telling your story...being seen...being witnessed...being heard. The best way for me to work through these kinds of stories, emotions and thoughts is with art journaling. In my art journal I can follow my intuition, pulling out the words and images, the texture of my emotional landscape to really expose my heart. Creativity is the key to the emotional excavation that happens within. And that’s what I’m going to guide you through. Believe me, it works like nothing else you’ve tried before. Love letter to my beautiful self. Rest assured that Susie has built her programs with your well-being and safety in mind. The environment is non-judgmental and open. You can explore ANYthing and EVERYthing! 8 weeks of connecting online on the topic of our love/hate relationship with our bodies. We will examine our own scripts, the words we repeat over and over which get in the way of actually seeing ourselves without judgment. We will share openly with each other and support each other in transforming our view of ourselves...our hearts, our skins, our wrinkles, and muscles, our bones that stick out, and our rolls of fat. We'll explore the parts that bring us the most heart pain (aka: shame). We'll push the edges and try on, in a safe environment, the concepts of self-love, self-acceptance, and pride. I’m so grateful to have had The Body Passion Project during pregnancy because I spent the first week postpartum LOVING my saggy, slowly deflating belly! That was a first! And I’m still (mostly) loving my body as it morphs back towards baseline. Other online courses that I’ve taken have been 2 dimensional. You make your course come to life as if we were in your studio with you. And, I felt safe and supported in my creative process; I always knew I could call on you if needed. I have never felt more accepted, more encouraged, and more peaceful than I did doing the work of this class. I am grateful beyond words for Susie and her work. Susie’s curriculum effectively guided me on a journey out of self-loathing towards an authentic embrace of my body. In The Body Passion Project you'll have the opportunity to face yourself and transform your body story. End the cycle of violence you’ve continued to inflict on yourself. You'll use creativity as your language of self-expression and healing. I’m all about the Deep Dive. To me, creative expression is the best way to transformation and we don’t get there by floating on the surface making pretty pictures. I mean that. This is not about your Instagram feed. This is about digging into your TRUTH with creativity. This is what I’m passionate about. And being person-centered means I am not the one with all the information about what you need. It means I trust you to know what’s best for your journey. I’ll be honest and clear and supportive. I will walk alongside you as you go, but I’m not the one who can tell you, “Go here. Do this. Do that.” I’m not your boss. But, if you need a really grounded guide, I’m totally your girl. And I’ll hold your hand all the way. Susie has a really special gift. Her presence is almost more powerful than anything. She let’s you be vulnerable and prompts you with some encouraging words to calm your inner critic. • You’re ready for transformation. • You’re ready to unlearn all the crap we’ve been handed from our families, our society, our religions, and time immemorial. • You’re ready to approach your body from a totally new perspective. • You’re ready to end the cycle of self-hate before you pass it along to your daughters, nieces and granddaughters. • You’re longing for a creative outlet for all the stuff that’s bubbling under the surface. • You’re ready to heal your relationship with your flesh. • You’re overwhelmed by feelings of shame, self-loathing, disgust towards your body, not to mention grief, anger, and sadness, and you’re longing for creative guidance out of it. • You’re looking for other women to connect with so that you don't feel so alone swimming in these treacherous waters. • You’re a Susie Miller groupie and want more. • You’re an experienced art journaler and you want to go deeper. You’re ready to feel self-passion! 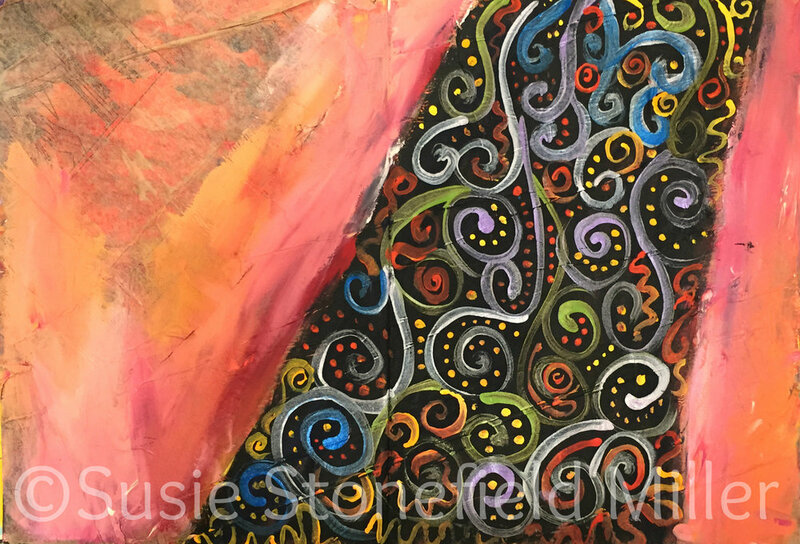 ✶ If you’d like to learn more about art journaling I recommend that you take my intro course, Start Art Journaling!, while you wait for this course to begin, or simultaneously. That way you'll get lots of great technique ideas as well as superb guidance on how to approach the page, journaling techniques and more foundational pieces. And if you register for the Body Passion Project Online by Dec. 31, you get Start Art Journaling! for free! Q: When will we get the lessons and pdfs? A: Every Monday new lessons will be shared with you. You'll get an email reminder with a link to our private course website. Q: How long can I access the course materials? A: You can download and save all the pdfs as soon as they're available (and there will be a pdf ebook of all prompts and worksheets available at the end of the course). The course will be available to you for six months from the end of the program. Q: How is the course set up? A: The course is set up in weekly lessons. At the beginning of each week you'll receive an email with a link to the course private website. Within each week's lesson there'll be a recorded video from me, written content, 2-3 art journaling prompts and worksheets, AND a live Zoom conference call link (90 minutes) for you to connect with others in the community, talk about the week's theme and what came up in your art making, and more. In addition, our private Facebook group will be open 24/7 for you to share your pages, ask questions, and converse. There will be space built into the 8 weeks, as well, to allow for deep processing and development. It won’t be an onslaught of materials. Q: When will the Zoom calls take place? A: At the beginning of the course I'll take a poll of students and we'll find a couple times/days that work for most people. They will be in the second half of the week (Thursday, Saturday or Sunday). Then, depending on the number of students enrolled, we'll either vary the call times between those times or have two live calls a week. Q: What if I can't make a Zoom call? A: All Zoom calls will be recorded and then posted to the group on Facebook and on our website. You'll be able to access the recording within 24 hours of the call. Q: How much time should I allot for each lesson? A: That is completely up to you as an individual. You'll want to spend time watching the weekly videos (which will vary in length from 10-30 minutes), reading the material, and then responding to the prompts through art journaling. Plus...90 min weekly for our Zoom calls. You don't have to do all the prompts, but you can! And as for how much time you spend on an art journal page, well, there are no rules! Q: Is there a specific time-frame in which I should do the work? A: I recommend blocking some time off weekly if you want to do this as part of the live community. However, since you will be able to access the information for six more months, you can do the work as it works for you even after the course ends. Q: Why is there a Facebook group? A: The Facebook group is an intrinsic part of our community connection. Inside the group you’ll share your photos and videos of your work, see others’ work, comment, and have conversations. It’s a place to connect on a daily basis, talking about the prompts, and the videos. Q: Do I have to have a Facebook account? A: I recommend it, but it's not required. If you don't want to be on Facebook proper, you can sign in just to our group and not wander the rest of the site. Or, you can skip the Facebook community, but that is where a lot of conversation, sharing and connection will happen, so again, I recommend it. Q: What do I need to do to get the most out of the course? A: A computer and internet access, a Zoom account, a Facebook account, and art supplies. Q: I've never art journaled before but this really speaks to me. Can I do this? Q: I don't own any art supplies. Can I do this? A: You don’t need much to do this work. A sketchbook, some paints, brushes, (or pastels or markers) scissors, glue, pens, and a pile of old magazines are what I recommend as the basics. As part of this program you'll receive a full list of supplies that can easily be purchased either online or in your local arts and crafts store. Even better, many of the supplies you'll need are found at home. Q: What if I get stuck in the middle of making a page? A: The Facebook group is a great place to post images and ask for guidance. You can also shoot me an email and we can talk! It's not uncommon to feel stuck. It's all part of the creative process! Q: Can I share the course website and login information with my friends? A: No. I have worked very hard to give you a beautiful and inspiring course full of content. I would love to have your friends join us the proper way by registering. Thank you for honoring this request. I also promise to respect you by honoring the time and money you have spent for the course by giving you a beautiful finished product. Q: What if I'm not happy with the course? Can I get a refund? A: Because of the digital nature of this course, once it has begun there will be no refunds. You may cancel up to the day before the course starts for a 50% refund of your fees or 100% credit towards another course or offering. Cancellation and Refund Policy: Because of the digital nature of this course, once it has begun there will be no refunds. You may cancel up to the day before the course starts for a 50% refund of your fees.